No more greasy Workshop Manuals! Just print off the pages you need and start fixing your VW. 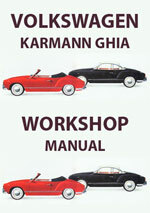 Workshop Repair Manual & Spare Parts Catalogue $8.99 Immediate Download!